Bellevue is considering adding a backyard cottage ( detached accessory dwelling unit ) provision to their zoning code. Most likely they will be limited to 800 sq. ft. in size or a percentage of the floor area of the primary residence. As with most other jurisdictions owner occupancy will be required in either the primary residence or the cottage. They want to know what the public thinks and they are conducting a survey. Take a moment to fill out the detached ADU survey. To see examples of backyard cottage designs visit the backyard cottage plans page of our website. What are the best lot for backyard cottages? The simple answer may be a lot meeting the minimum lot requirements, relatively flat with alley access and ready access to water and sewer. The true answer is much more nuanced. A flat site may minimize site costs and alley access certainly provides parking options but challenging sites may ultimately inform and result in the best designs. A case in point is the eco cottage we are designing in Seattle's magnolia neighborhood. Here the steep slope provides an option for an attached tower with a bonus room that can be part of the cottage or used by the primary residence as a home office connected by a bridge. The slope also provides a nice separation and privacy for the residents of the two structures even though they are located on a fairly small lot. Beyond the physical aspects of the site there is a social component as well. A lot close to amenities such transportation, family and work will be a better value for anyone who lives there. Elderly Cottage Housing Opportunities ECHO for short generally refers to temporary prefab housing units placed behind a home to provide a home for an elderly parent or a caretaker. They have been around since the 1970's and have been gaining popularity recently. No doubt in part because of the rising cost of care. Most people hope to age in place, a catch phrase for seniors living at home as long as possible. And why wouldn't we want to grow old near the families and the communities that support us? ECHO housing because it can incorporate universal design and health monitoring systems is able to prolong the period of in-home residence. Because it can be located on the same lot as a family member's house, or can be lived in by family member, they can provide a invaluable part of a multi-generational living experience. The recent expansion of backyard cottage ordinances is an exciting development for aging in place and ECHO housing advocates. Unlike temporary housing units available the past, increasing numbers of municipalities are allowing site built backyard cottages. These cottages can be an attractive addition to a home that will add to the properties value. Temporary structures on the other hand, have a short life span and become a long term liability for the homeowner. Site built backyard cottages may also be financed with an inexpensive equity line of credit often available to seniors who have built up equity in their homes but have limited incomes. To view a partial list of municipalities that allow backyard cottages check out our backyard cottages other cities page or contact us directly. Can I build a backyard cottage on my lot? Many municipalities particularly on the west coast are revising their zoning codes to allow backyard cottages (Detached Accessory Dwelling Units) on residentially zoned lots. In general there are restrictions requiring minimum lot size, building lot coverage, setbacks, building height and area. Some jurisdictions limit the occupancy to a family member. For a partial list of municipalities that allow backyard cottages view our backyard cottages other cities page. In Seattle you can determine if your lot meets the requirements by checking your lot on the DPD GIS web site as outlined on our backyard cottages Seattle page and giving us a call or email. We can usually assist you in making this determination on the phone. Lots with less than 4,000 sq. ft. existing accessory structures and those located in environmentally critical areas (ECA) are two situations that require extra attention. Fortunately, we have a great deal of experience with these projects and can assist you in determining what your options are. Announcing the first annual international MY KID COULD DESIGN THAT- backyard cottage design challenge. A backyard cottage is a small house that shares a lot with a larger primary residence. The challenge will be to design a backyard cottage that you would like to live in for your own back yard, or a suitable location near where you live. The cottage should accommodate the functions of a house, including living, sleeping, eating, and cooking, and fit within a 20 ft. x 20 ft. x 20 ft. volume. It’s not an easy task. Design ideas may be expressed in any medium from paint on paper to cardboard to gingerbread and hand drawing and physical modes are highly encouraged. This is a great opportunity to use supplies readily found around the house including leftover holiday packaging. The competition will be a showcase for the creativity of those ages 8 - 18. And not only will the competition be fun, its free. All entrants will be featured on the seattlebackyardcottage blog. In conjunction with the competition, Architecture 101 will be hosting a design classes over the Thanksgiving holiday and again in late December 2010 and will host the awards ceremony in January 2011. Aging in place (also aging at home) is a catch phrase for seniors maintaining independence by living at home as long as possible, a goal most of us share. Unfortunately, many factors may conspire against this dream. Typical houses and living environments often don’t often favor seniors. In many instances our homes are not accessible for those with mobility impairments and may be located away from family and services. Backyard cottages are an great option for many seniors. On one hand, families may be able to build a backyard cottage on their lot enabling all the benefits of multi-generational living. However, unlike moving into a room in the main house, seniors and their parents are able to maintain their independence. Because new cottages can incorporate universal design standards that facilitate mobility they may be cheaper than remodeling an older house to say add a downstairs bath, or a residential lift. There are many other considerations like efficient environmental controls, easy to use hardware and appliances that will enable a senior to live and function comfortably in their home. The Wheelocks are an example of a son building a cottage for his aging mother adjacent to his house. The 800 sq. ft. Tangent Cottage designed by Anne Van Dyne, provides a beautiful and functional home with a traditional craftsman flair and vaulted ceilings and a large deck for entertaining. The local zoning and sloping site allowed for the cottage to be built over a workshop used by the son for his business. Beyond the immeasurable benefits of having family close by, there may be real financial incentives as well. In home assistance is much less expensive than assisted living or a nursing home care which runs in the range of $3,000 to $5,000 per month*. The cost of a cottage financed through an equity line of credit is in the range of $1,000 per month and increases the value property. 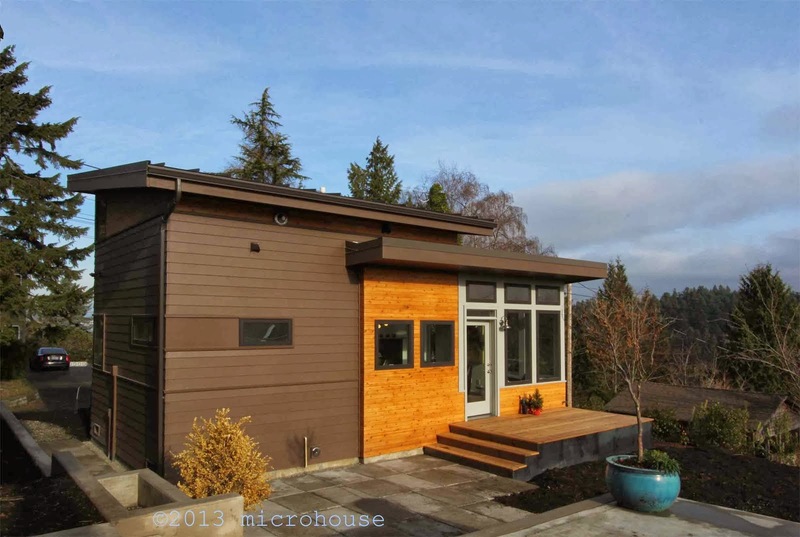 A Microhouse representative will be at the Seattle Home Show, Friday October 8th from 10:00 AM to 12:00 PM. We will be answering questions about backyard cottages and catching up with our partners at the Homeowner's Cooperative in their booth #507. Also be sure to check out the Ecohaus booth where you can learn more about the sustainable materials featured in our projects. A nice story about microhouse and backyard cottages (detached accessory dwelling units) is featured in the Highline Times. It features an interview with a client who built a backyard cottage for his mother. The cottage allows his ageing mother to live close to family and maintain her indepedence. 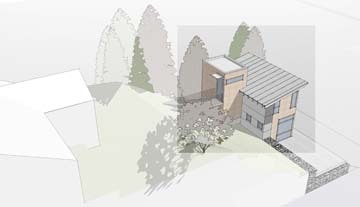 Design has started on Microhouse's newest backyard cottage in Magnolia. Our clients are looking to use some of the equity in their home to establish a rental property that could be used by a family member in the future. A secondary goal is to provide a home office for personal use. The steeply sloped ECA site has its share of logistical challenges as well as opportunities. Using the Eco cottage plan as a design departure point we are able to come up with a cost effective two bedroom design with a minimal amount of site work. Tweaking the design to take advantage of the site slope we are able to pull the bathroom and circulation outside of the main plan into a tower structure that will house a home office on the top floor. The office can be accessed via a bridge from the main house via a bridge or from the cottage. The dual access allows it to be a third bedroom for the cottage or an office for the owners in the main house. Microhouse small house plans and design services will soon be available nationally through houseplans.com. Microhouse will be one of the featured designers along with the likes of Sarah Susanka of "Not So Big House Fame". We are excited to be able to participate in the small house movement at the national level. This will also enable us to be a part of the growing backyard cottage movement as it spreads east to cities like Denver and Madison. Ecohaus locations in Seattle, Portland, and San Francisco will continue to provide a great resource for Microhouse patrons. Their well staffed showrooms are a great place to view our standard finishes and materials. 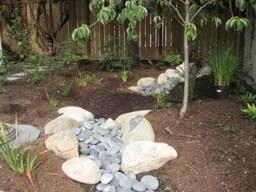 Here is a photo of a small rain garden designed by Landscape Architect Vinita Sidhu nearing completion Ballard. The garden is designed to handle the roof runoff from an existing garage. During heavy storms and prolonged periods of rainfall the rain garden will briefly fill with rainwater. 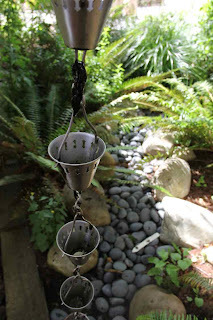 The owner chose a decorative rain chain to connect the gutter to the inlet providing visual interest even during periods of light rain. The rich soil mix chosen for the rain garden forms a depression that will collect the water like a sponge slowly releasing it into the ground. Water loving native plants will thrive here. Prior to the installation, the runoff was collected by a combined sewer system, pumped, treated and discharged into the Puget Sound. Our newest new small house plan the Atom. The idea for the atom cottage comes from a 1940's prefab house built by the U.S. Government as worker housing at Hanford. 1,200 of the small modern units were built. Many still exist including the 400 sq. ft. one bedroom model that I lived in for a year during college. Infill cottage housing for volunteer workers, I thought, would be a great re-purposing for this house. In Richland, when the houses were originally built, land was in abundance and the car was king. The current proposal for an undeveloped urban infill site, requires a more compact footprint and greater emphasis on community. To date, two plans have been developed. One 200 sq. ft. studio loft unit and one 400 sq. ft. 1 bedroom unit. Contact us for pricing and additional information. 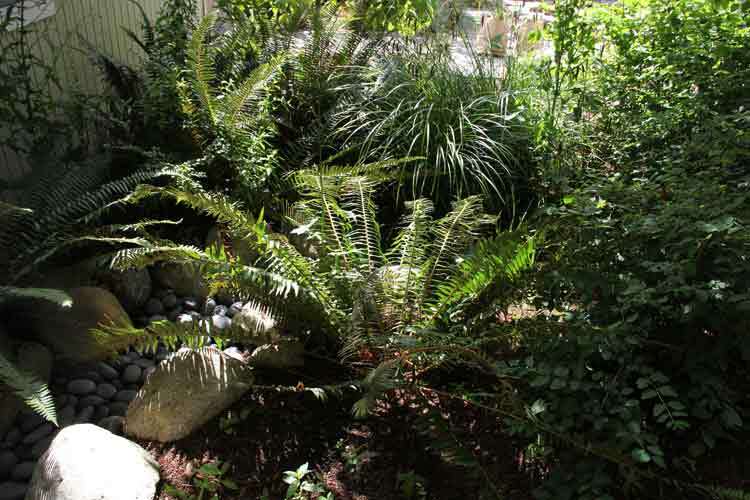 At Microhouse we have years of experience designing rain gardens and other water retention systems. Whenever possible we incorporate rain gardens as part of our overall design strategy along with thoughtful drought tolerant plantings and reduced impervious surfaces. Contact us to find out more about the possibilities for your site including incentives. For the Ballard test area Seattle Pubic Utilities will pay $4 per square foot of impervious surface runoff collected. Rain Gardens 101: Rain gardens are small retention ponds that collect runoff from impervious surfaces. In many parts of Seattle rain water that is not absorbed into the ground (runoff) is collected into combined sewer systems (CSO's) where it is combined with sanitary sewer. The cost of conveying and treating this runoff is considerable which is why Seattle Public Utilities can offer incentives to homeowners who reduce runoff by building rain gardens. In a pristine environment, most rainwater would be absorbed into the ground, picked up by plants, or slowly percolate to recharge local streams and ground water. In urban area impervious surfaces like paving and roof tops prevent rainwater from entering the ground and must be collected and discharged. Increased runoff from these surfaces create excessive peak flows that lead to erosion and water degradation. Runoff often contains biological contamination from fertilizer and pet waste and oils from road and driveways. Rain gardens increase groundwater infiltration and break down these contaminants keeping them out of local waterways. 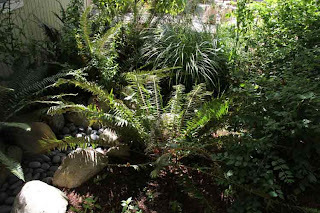 Rain gardens also create meaningful water features and provide great landscaping opportunities. Check out the Seattle Public Utilities Rainwise Program for more great resources. Microhouse will make a virtual appearance at the West Seattle Summer Fest along with our building partners Ncompass Cottage Company. In collaboration with Ncompass we are able to a provide a more comprehensive design/build process. The integration the design and building results in smarter designs, improves construction quality, and reduces cost. Stop by and say hi to Stefan and Drew and talk to them about your project. 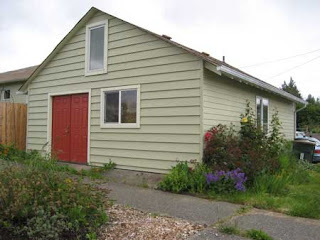 They have 30 years construction experience working in and around West Seattle and are enthusiastic about the new opportunities allowed by backyard cottages. Their booth is located on California Ave SW just South of Key Bank. Are you interested in renting a backyard cottage or do yo have an existing cottage that you would like to rent? We have both potential tenants and renters. Contact us to find out what we have in your neighborhood. All inquires are confidential. We have a proven track record of legalizing existing cottages built without a permit and a select group of select contractor referrals. Net metering makes solar electric or photovoltaic (PV) practical in the Northwest. Net metering banks the energy your system makes during the long sunny summer days for the use in the evenings and on short, dark winter days. Your electric meter spins backwards when your home is not using the energy generated by the PV system. The extra electricity goes to the grid, and you earn credit for power produced that your home does not use. PV systems collect electricity from panels and send it to an inverter and into your homes electrical panel. They require little or no maintenance. For each 1,000 Watts or 1 kilowatt (kW) you can produce up to 1,180 kW hours of household electricity per year. 1kW of PV takes 65 to 90 sq. ft. of roof space. On our 800 square foot hyper-efficient Eco cottage we estimate that a 3 Watt system with a solar hot water heater should be able to approach net zero model. The estimated cost for the 3 Watt system is $18,000. This cost can be partially offset by a number of incentives. Financial incentives can help offset the upfront costs of installing a solar system. Solar (PV) and hot water systems are eligible for 30% federal tax credit that can be taken over 2 years. WA State sales tax (varies by county) is waived. Utilities are required to allow homeowners to hook solar, wind systems up to the grid. When your home uses less than your system produces your electric meter spins backwards, earning credits. You can draw from your energy credit when PV system is not producing. WA State utilities are authorized to pay $.15/kWh for every kilowatt-hour produce by net-metered solar, wind and biogas systems. If you by an inverter manufactured in Washington State that rate is boosted to $.18/kWh. Do you need help legalizing an existing backyard cottage built without a permit? We helped Lars and Denise to legalize their cottage originally built as a one room schoolhouse in the 1960's. It was converted to a cottage sometime after that. Lars and Denise have made numerous upgrades to the building to create a nice rental unit. As a result, the work required to permit their cottage was fairly minimal. In general, legalizing, or establishing use of an existing cottage, requires bringing the cottage up to current building codes. This may include ventilation, electrical, energy and seismic upgrades. For many older cottages the condition of the foundation may be of primary concern. The current building code has minimum requirements for concrete foundations and the building mudsill must be bolted to the foundation. Cottages originally built as garages may not have adequate foundations. Meeting the current energy code may also require upgrades. For Lars and Denise this meant adding insulation to the cottage ceiling and perimeter of the foundation. They also had to add a fan in the kitchen. Why legalize your backyard cottage? Municipalities that have revised their zoning codes are offering a carrot to homeowners. The stick is that they are cracking down on illegal cottages. In Seattle landlords will be required to register their rental units and be subjected to mandatory inspections beginning October 1st, 2011. Seattle also levies a minimum $5,000 fine for dwelling units established without a permit with additional daily penalties. If you have a cottage that was inhabited as as residence prior to 1956 you may be eligible to establish you cottage as a stand alone residence without meeting current building codes. Contact us to find out more. Microhouse will make a virtual appearance at the Seattle Green Festival June 5th and 6th. We try to keep a low overhead here so we won't be an exhibitor, but you can check out the Smart Module plans at the Method Homes booth and learn more about prefab construction. You can also check out the great sustainable materials and finishes that populate our designs at the Ecohaus booth. If that leaves you wanting more contact us. The microhouse smart module wins big at the backyard cottage design challenge award event. The event was cosponsored by the City of Seattle to raise awareness of backyard cottages and promote design excellence. What is the smart module? The microhouse smart module is a prefab unit that contains the all basic elements of a contemporary home. Grouping the environmental systems, plumbing, cooking and sleeping in a small prefab unit reduces construction cost and maximizes space for work and play. It’s small footprint is ideal for infill lots, environmentally critical areas, and everywhere else. The smart module can be attached to existing accessory structures such as free standing garages to create a backyard cottage.The smart module can also be combined with new prefab units, on site construction, or serve as a stand alone cabin with room to grow. function: kitchen, bath, sleeping loft, and mechanical room. uses: add module to existing or new construction or use as a stand alone cabin. dimensions: 8 ft. x 16 ft. x 13 ft. tall = 128 sq. ft.
construction: prefab, stick built or sip panel. Included in the backyard cottage legislation is a “grace period” that allows owners of existing, unauthorized backyard cottages the opportunity to legalize their unit without penalty. Owners have until June 30, 2010 to apply for a building permit and until December 31, 2010 to obtain final inspection of the unit. The friendly folks at DPD would like to remind you that owning an unauthorized backyard cottage you may be subject to fines. Not to worry though, we can help you legalize your existing unit but time is quickly running out. We are currently developing a 128 sq. ft. prefab smart module that will contain all the basic living functions, kitchen, bath, sleeping loft, and mechanical room. The smart module can be a stand alone cabin or be "plugged into" an existing or new structure. The smart module will be unveiled on May 24 th at the Backyard Cottage Design Challenge Awards Event backyard cottage awards. The event will feature prefab cottage designs by 35 area designers. Microhouse announces a partnership with ecohaus one of the top sources of sustainable building materials and green building information. 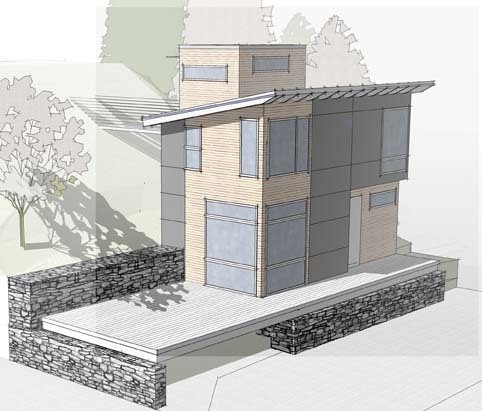 Microhouse plans now feature a standard specification of ecohaus materials, including flooring, cabinets, countertops, and paints and finishes. Now you can bundle your favorite green products under one roof and receive a discount on design and materials. This is a great option both for those who want an all inclusive design package and those who want to be able to pick and choose individual items. Contact us for more information about pricing and selection. Congratulations on the opening of the new ecohaus retail outlet in San Francisco. Click here or more information about ecohaus. microhouse is looking for sponsors to host a 3d model of one of our cottages on their lot to increase awareness about backyard cottages and promote our designs. Virtual cottage participants will receive a $200 credit towards the design of a new cottage. In one day can Seattle build 10 Gardens? 100? 1000?. On Wednesday, January 6, a small group of people met at Solid Ground in Wallingford to discuss and begin organizing vision and action for Seattle’s First Annual city-wide food garden building event. Much excitement and vision were generated in the week following the meeting. The event is tentatively named “Spring into Bed” and this post is intended to introduce you to this effort and to elicit your ideas, thoughts and feelings on participating in such an event. In February, Mayor Mike McGinn and Seattle City Councilmembers announced the "2010: The Year of Urban Agriculture" campaign to promote urban agriaculture efforts and increase community access to locally grown food. A number of northwest cities have modified their zoning ordinances to allow detached ADUs. They appeal to families because they provide opportunities to grow or to provide rental income. They appeal to cities because they provide additional housing options and increase density. 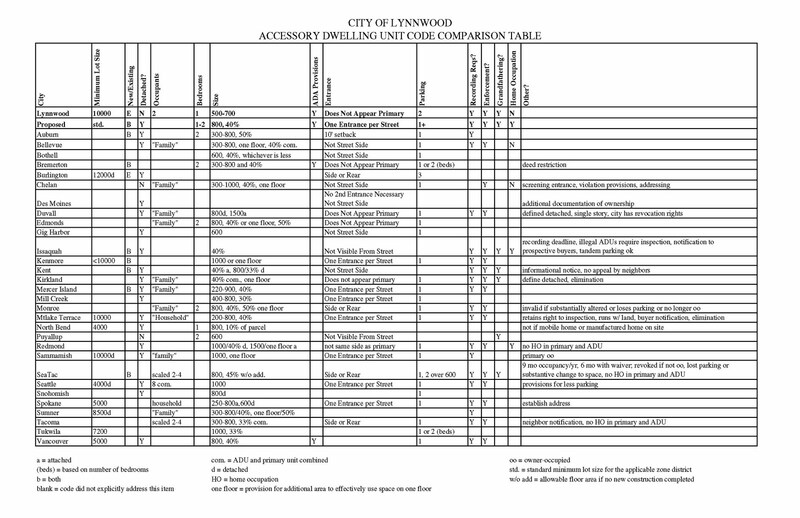 For a brief overview of some of the ordinances in Washington State check out this link to the City of Lynnwood. 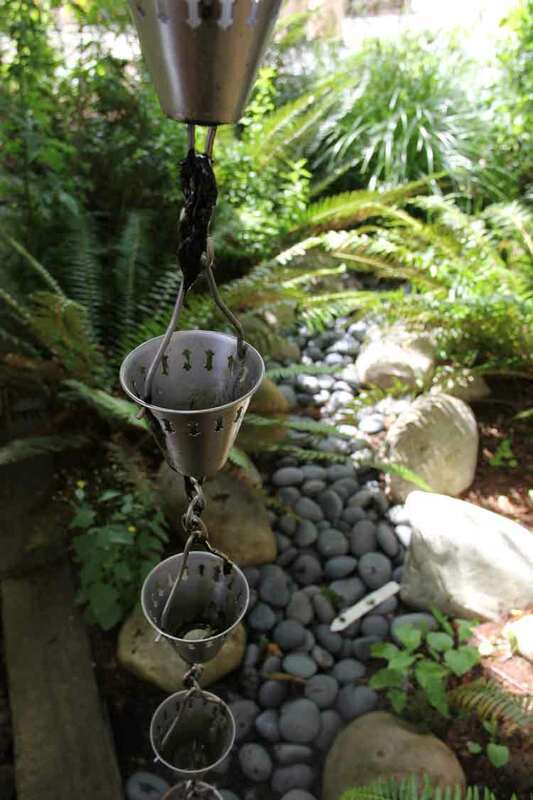 The City of Seattle has recently expanded the existing backyard cottage ordinance. The new ordinance allows backyard cottages in all Seattle neighborhoods on single family zoned lots that are at least 4,000 square feet. There are other specific requirements; contact us to find out if a backyard cottage will work on your lot. To learn more about your lot click on the following link. 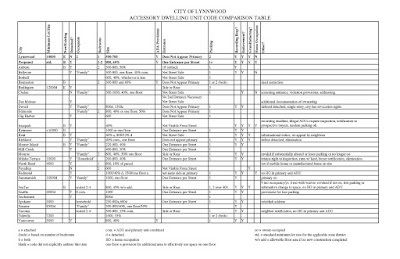 On the upper left hand corner under under base zone it will say if a detached accessory dwelling unit is allowed. No? Don't despair, you have gained some valuable information. We can help you determine what options are available to you. The much anticipated Google bicycle mapping function has now arrived. By now everyone should know that bicycling is a great carbon free method of getting around. It has now gotten easier, well not really easier, but at least least there is one new application to encourage get people out of their cars. Check out a bike map of your commute today. In the last year microhouse staff have completed 2,550 miles of carbon free commuting by walking or biking to work. How Do I Finance My Backyard Cottage (DADU)? What is the best way to finance a backyard cottage? Here is advice from Joseph Lancaster at Verity Credit Union. Construction loans are very hard to come by these days so the easiest option for someone looking to finance a cottage is to get a home equity loan (aka second mortgage) on their current residence. At Verity Credit Union, we currently pay the closing cost for all home equity loans (not including appraisals if deemed necessary) and have very competitive rates. HELOC’s (Home Equity Line Of Credit) are great options for people building cottages because they work like credit cards: you have a credit limit (say $100,000) and a balance that your payment is based on (minimum payment is interest only). Our HELOC’s range from 5.5% to 6.5% APR depending on the Combined Loan to Value ratio (CLTV) of the home. Apply soon, as Verity currently has an Intro Rate Special on HELOC’s: 4.49% APR through June 30, 2010 (reverts to qualified rate on July 1, 2010). We also have two fixed rate home equity loan products: a 15 year fixed loan and a 30/15 fixed loan, which is amortized over 30 years to keep the payment down, with a balloon payment due after 15 years. These fixed rate products start at 6.24% APR and with 3 possible discounts of 25 basis points each your rate could be as low as 5.49% APR. The rates of our fixed rate products are based on CLTV and credit score and have no annual fee. For more information please contact me, Joe Lancaster, at 206-315-6718 or JosephL@veritycu.com. come visit us in the harry potter space under stairs on the lower level. 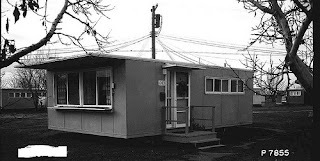 Many of the prefab houses built by the govenment in the 1940's are still around including the one that I lived in for a year. An unassuming 400 sq. ft. 1 bedroom modern box. 1,800 were built in 1944. The City of Richland Published "home blown, the history of the homes of richland", in 1993. It is a great booklet. I look forward to doing some early prefab mashups for the microhousenw site. The one bedroom prefab pictured below shows the gable roof added in the early 1950's. This nice web site has an overview of the Richland letter houses. Microhouse will be at the Phinney Neighborhood Assoc. Home Fair on January 31st. and will have Internet access. We will be able to answer whether specific lots qualify for a backyard cottage, provide preliminary design, guidance and email a sample packet to homeowners. Representatives from the Seattle Department of Planning and Development (DPD) will also be there to answer questions. 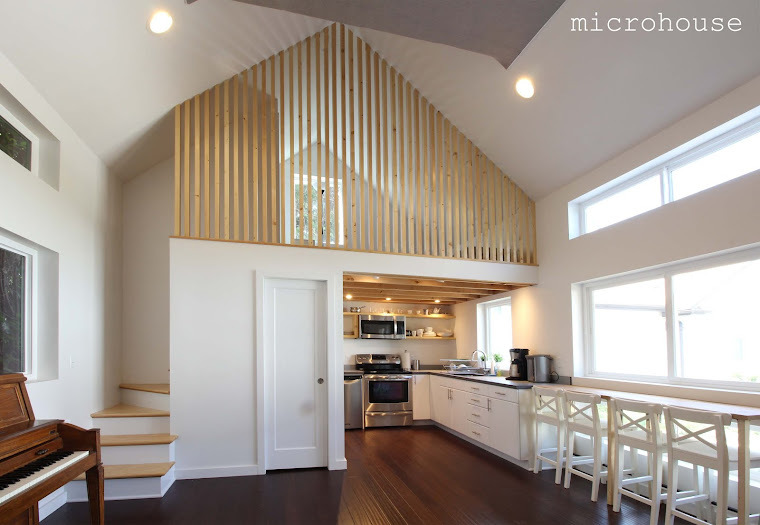 microhouse featured yesterday in the fremontuniverse blog.